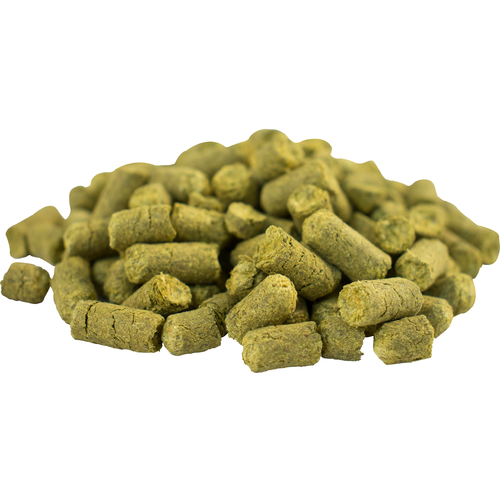 Azacca is a new hop from Washington that has great aromatic qualities making it great at late or dry hop additions. The aroma has sustained citrus and mango notes with a little orchard fruit. The high myrcene fraction makes this hop great in IPAs. Also with its high acid content, Azacca can be used at the start of a boil to great affect. Hear it's a great hop for a hop forward beer. I like to get freaky. I like trying different hops compination for new recipes. I love using these hops! Fantastic tropical aroma and flavor. Brewed a tropical pale ale with this in late boil. Nice floral aroma. I used the Azacca in a 50/50 blend with Centennial. The Azacca smelled really grassy before brewing with it, but I really liked the finished product. Made a great APA. Great hops, great supplier, great service. As always. I used Azacca hops in an IPA as a dry hop addition. It was underwhelming. Some flavor but very muted. Not impressed. I made a SMaSH beer with pilsner as a base. The aroma and flavor descriptions are accurate. However, this is not a big hop like Citra. There was no single flavor characteristic that really came through. I think this hop is better utilized blended with other hops, but it made a very enjoyable single hop lager. Muted tropical notes with slight pine, not as hop forward as some popular American hops. 8oz bag contained green coffee beans too not sure that helped. This has happened a few times to me with the 8oz package with various hops. I made a single hop IPA with it. Big whirlpool addition and big dry hop. Not pleased with the end result. I think it might have a place in a blend of three hops, but doesn't work well alone. At all. The aroma and flavor itself is good - but just doesnt have the oomph. I suppose I can detect the described citrus, mango, and orchard qualities but im not the best at descriptirs. I wouldent really call it tropical. I used 1 pound in a 5 gal batch of new england style ipa (5 grams boil, 4oz flame out, and three 4oz dry additions). Even with such a low "bittering" addition the bitterness contribution (from all additions) seems to over power the aroma / flavor. Next time I will pair with something along the lines of mosaic or use in a saison, blonde, wheat etc.